At the 2015 Oscars, the most emotional moment of the night was undoubtably "Glory" performed by John Legend and Common. The song, an epic and historically significant ballad, is a song inspired and for the film Selma. Selma follows the true story that took place 50 years ago, chronically Martin Luther King Jr., his wife Coretta Scott King, and their supporters and fellow activists as they marched from Selma to Montgomery in the hopes of securing equal voting rights. 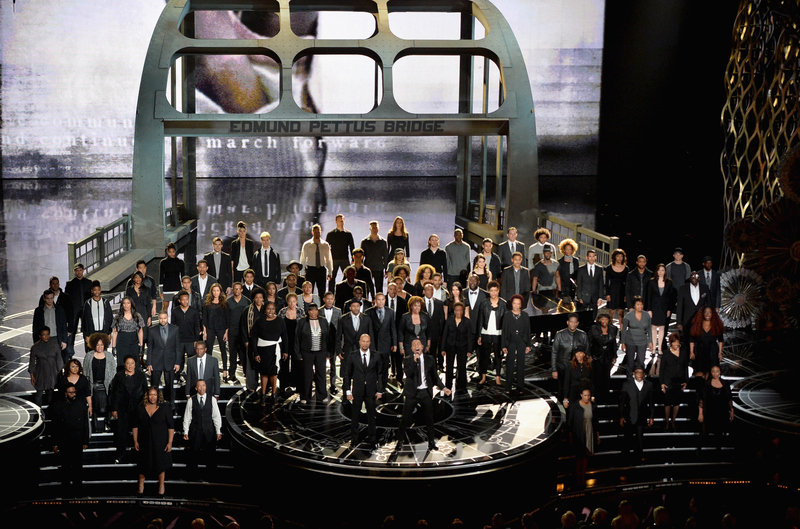 When the song was performed at the Academy Awards Sunday night, there wasn't a dry eye in the house. A touched David Oyelowo (who was notibally sobbing as Oprah wiped away his tears), to a ever-so-darling Chris Pine, were shedding tears. Pine appeared notably stoic but moved by the song, whose lyrics include: "That's why Rosa sat on the bus/That's why we walk through Ferguson with our hands up/When it go down we woman and man up/They say, "Stay down" and we stand up/Shots, we on the ground, the camera panned up/King pointed to the mountain top and we ran up." When John Legend and Common took the stage to accept their award, Legend said: "We know that right now the struggle for freedom and justice is real. We live in the most incarcerated country in the world..."
And as The New York Post pointed out, no one can look as good as Pine crying.